This being a “Volume 3,” I have to admit that I felt just a bit lost. There appears to be a storyline that started in another volume, continued here, and in some ways, the preceding story seems to be necessary to understanding what is going on here. 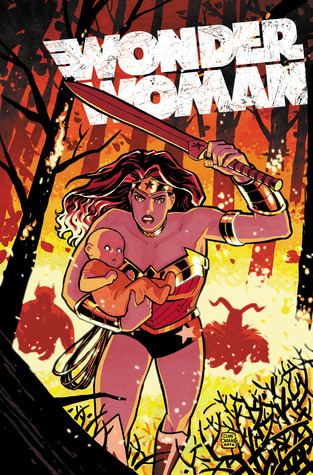 Bottom line…Wonder Woman is in search of a baby … the offspring of Zeus and human woman, whom Hera (and others) wishes to kill. The book starts with a short story about Diana, twelve years old, training with Ares and on a quest. The art is interestingly very 1940’s in style, which works well for this ‘early’ story about Wonder Woman. The story nicely sets up Diana’s moral code, which is set at odds against Ares, and presumably the rest of the gods’. And while we see that moral code in effect in the rest of the book, I mostly find the story tedious and without action. The gods lounge around and talk, while Diana seaches. Yes? And then? The sub-plot, with Zeus’ first child is enticing, intriguing, and well-worth reading, but it, too, seems to go nowhere in this volume. Instead, it’s a teaser, an incomplete story-line, trying to get us to buy the next volume. As comics, on a regular publication schedule, we expect on-going story-lines. In a book volume, we should expect much more completed stories. I was never a regular Wonder Woman reader, even when I was a comic reader, but I don’t recall quite so many mythic figures. Zeus? Hera? Ares? etc. Tis feels like author Azzarello and DC Comics trying to hop aboard the myth band wagon…playing on the popularity of other titles, including the Percy Jackson books and films. The art for the book is fair at best. It strike me as a cross between realistic comic illustration and the Cartoon Network’s JLA series. I think we’ve come to expect a little better in our comics. Looking for a good book? This graphic novel just doesn’t have the power of Mount Olympus to be worthy of buying.